This recipe is from Cagayan Region 2. For those not very familiar with Himbabao or alucon (a tagalog version), it is a caterpillar shaped flowers and distributed throughout the Philippines from Luzon to Mindanao. 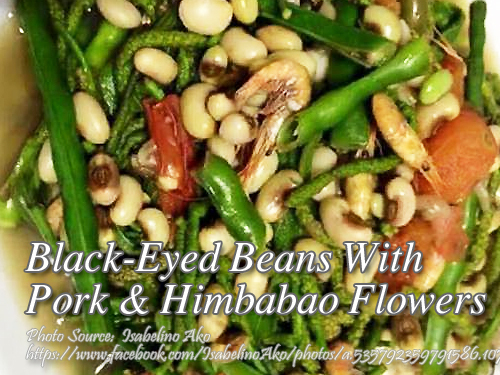 Combines with black-eyed beans and pork, this will make dish that is both delicious and healthy, that is, if you are fond of eating vegetables. To cook black-eyed beans with pork and himbabao; Heat water. As soon as it boils, add beans and cook 2 minutes. Set aside for 1 hour. Sauté garlic, onion, tomatoes and pork. Add beans including broth. Boil, then simmer until almost soft. Season with salt cook 4 minutes. Bring to a boil once more and add himbabao flowers. Cook 7 minutes longer. Heat water. As soon as it boils, add beans and cook 2 minutes. Set aside for 1 hour. Sauté garlic, onion, tomatoes and pork. Add beans including broth. Boil, then simmer until almost soft. Season with salt cook 4 minutes. Bring to a boil once more and add himbabao flowers. Cook 7 minutes longer. Serve hot. Six servings. Alukun in Ilocano, Himbabao in tagalog, Alibabag in Itawit, Alibabak in Ibanag ,this vegetable tree is fast becoming extinct in the country landscape. During my childhood days , this tree is oftenly used as fencing post. The flower of this tree goes well with mongo but if gathered fresh , it can be cooked alone with a cup of water for a cup of the flower and a tea spoonfull of bagoong.It also goes well as one of the ingredients in pinakbet , but it should be the last to mix among the ingredients. The thing is , you should gather it fresh and immediately use it for cooking ingredients , otherwise it does not taste well. I missed that dish. That would be very exotic or extremely unavailable in groceries here in the US. I hope it could be featured in Foodnetwork.com as exotic healthy dish. Very nice dish, but most of the kids don`t know it.